Great apartment I stay with this company a lot and they are always brilliant the host is great, the location Perfect and always has everything I need there. The location was very convenient, close to the subway stations and shopping areas. The apartment was very spacious and well equipped and furnished. It was well located. Haing a washing machine was a bonus. Très bon accueil de Nick, très ouvert et bon conseiller. Lock in a great price for Glasgow Merchant City Ingram Street - rated 9.1 by recent guests. One of our bestsellers in Glasgow! Situated in Glasgow, Glasgow Merchant City Ingram Street has well-equipped accommodation boasting free WiFi, 550 yards from Glasgow Cathedral. Glasgow Necropolis is less than 0.6 miles from the apartment. 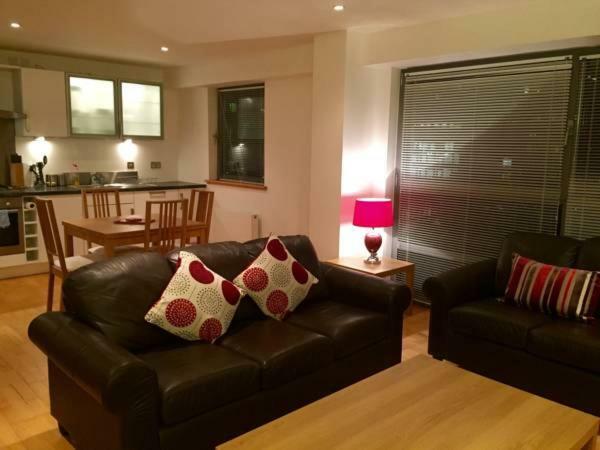 Glasgow Merchant City Ingram Street has been welcoming Booking.com guests since 4 Nov 2015. When would you like to stay at Glasgow Merchant City Ingram Street? This apartment has a tea/coffee maker, microwave and washing machine. Great apartment, located in the city centre. Want to deliver the best product and experience to guests. Great bars and restaurants nearby, located in the merchant city. House rules Glasgow Merchant City Ingram Street takes special requests - add in the next step! Glasgow Merchant City Ingram Street accepts these cards and reserves the right to temporarily hold an amount prior to arrival. Please inform Glasgow Merchant City Ingram Street in advance of your expected arrival time. You can use the Special Requests box when booking, or contact the property directly with the contact details provided in your confirmation. the bed is damage and don't move much u will end up sleeping on the floor , the couch was very old ,second is the shower, the sink so much inside that it floods. Experience with check-in was awful. I called the host when I was near the building, the host said he was on his way but I had to wait 40 minutes for him. When he arrived he only apologised after I mentioned I had been waiting for him. The apartment was not very clean and bed and the pillows were very uncomfortable. There was some noise during the night (some people yelling). The apartment is near a university and probably most people in the building are students, so can be a bit noisy during the night. Good location, near a lot of restaurants. Toilet paper and garbage bags weren’t refilled. For a stay as long as 7 nights , this was a wee bit inconvenient. The loung and the bed were a little low for my liking.